Meli Cafe & Bakery is finally open. After watching its progress pretty much the whole summer, I was glad to see it's finally come to life a couple of weeks ago. My curiosity got the best of me, as always, and I walked in to see what it was about. In a nutshell, it looked a bit underwhelming with the display not fully stocked, but I also went in at the end of the day so that could've played a big role. From what I saw, they sell simple cookies, doughnuts, coffee and these really pretty coffee cakes that caught my eye. They looked gorgeous, perfectly round in shape with a nicely browned exterior. I wouldn't mind taking a bite out of this and plan to try it soon. In the meantime, if anyone has any valuable feedback to add about this new bakery, please chime in. 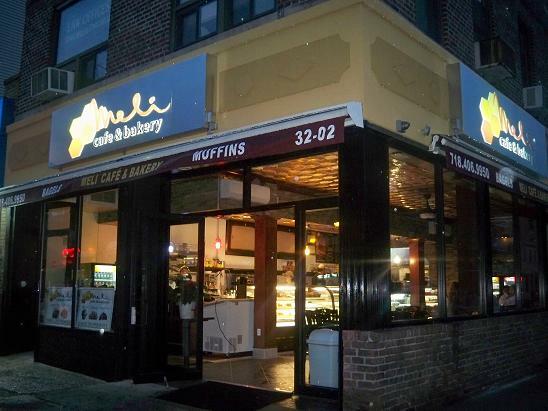 They also have bagels, muffins, breakfast platters, a deli section, etc. Usually have some deals each day. They have been doing a small coffee and plain bagel for $1.50 deal, but be warned that they mean PLAIN bagel. Nothing on it or anything or you are getting charged full price. The owner also makes his homemade honey - comes from upstate - hence the name Meli (honeybee). Great muffins! The doughnuts are pretty wonderful, a bit thicker than at most places, but still very moist and tender. I went in before they had officially opened and they gave me and my girlfriend a couple of free glazed ones for our curiousity. I haven't ventured further than that, but they seem a cut above most of the other bakeries on 30th Ave.